More Women Reach for the Legislature. What Are Their Chances in November? Members of the state Senate are shown here in May 2018. Seven of the 48 senators are women. What is likely a record number of female candidates, 140, filed paperwork in April to run for one of the state’s 125 legislative seats to be decided in November. 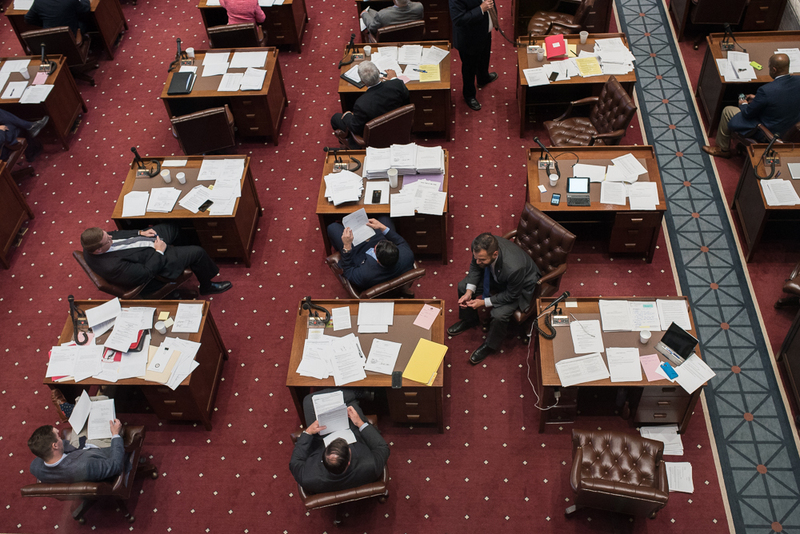 In a state where men outnumber women in the Legislature six to one, ranking Oklahoma 49th in percentage of legislators who are female (14%), many women’s advocates saw this as an opportunity to narrow the gender gap. But as a narrowed candidate field prepares for the final stretch of the campaign, it is far from certain that the gender gap will close significantly. An Oklahoma Watch analysis found that women make up 29 percent of candidates who either will be on the general-election ballot or who have already clinched election. This tracks closely with the 31 percent of legislative filers in April who are women. That percentage was the highest in decades and represented a significant jump from 2010 and 2012, when women made up just 15 percent of the candidate field. But the question remains whether the surge will translate into more women being elected to the House and Senate. Nationally, an increase in female candidates is being attributed to the #metoo movement, opposition to President Donald Trump and increasing voter acceptance of women leaders. In Oklahoma, issues such as teacher pay and the state budget crisis have helped drive more women to run for the Legislature. A look at the remaining candidate field shows that narrowing the gender gap is within reach, but the prospect of a major change is slimmer. There are currently 21 women in the 149-member Legislature. All 101 House seats and half the 48 Senate seats are up for election. Five women – Sen. Kay Floyd, D-Oklahoma City and Reps. Rhonda Baker, R-Yukon; Emily Virgin, D-Norman; Regina Goodwin, D-Oklahoma City, and Democrat Ajay Pittman – have already claimed seats in the 2019 Legislature because they don’t have a general-election opponent in November. They will join Sens. Julie Daniels, R-Bartlesville, and Allison Ikley-Freeman, D-Tulsa, who aren’t up for election again until 2020. At least eight additional women will win seats because there are eight House or Senate races in which voters will choose between two female candidates. That would bring the minimum total of women legislators to 15. But predicting beyond that number gets tricky. Just seven of the 44 incumbents running are women. And incumbents historically have had the most success on Election Day. On the other hand, being an incumbent isn’t the comfort seat that it used to be, at least this year, as 12 incumbents lost in the primary season. Partisanship could also be a determining factor in women’s chances for increasing their legislative numbers. Of the remaining candidates who are on the general-election ballot or have already secured their seat, Democrats have far more women: 46 percent of the Democratic field are females compared with 15 percent of the GOP field. In a state where Republicans lead Democrats in voter registration 47 percent to 38 percent, many Democratic female contenders could find it tough to pull off a win, depending on the district. That includes the nine women candidates, all Democrats, who face an incumbent Republican. Twelve other women, again all Democrats, are running in open seats that were last held by a Republican. Oklahoma’s gender gap in politics can also be seen in statewide and congressional races. Only seven women will be on the general ballot for the state’s five congressional seats and for governor, lieutenant governor, attorney general, commissioner of labor, corporation commissioner, state treasurer, insurance commissioner and superintendent of public instruction. That compares with 23 male candidates, comprising three-fourths of the candidate field. Partisan factors aside, women candidates have had a measured success so far this year. During the June primary, 74 female candidates either won their primary challenge outright or advanced to the runoff; 45 were defeated. In the August runoff, 10 of the 26 candidates running were victorious. Liz Waggoner, executive director of the Oklahoma Women’s Coalition, which sponsors a nonpartisan “Pipeline to Politics” program to encourage more women to run, said the election victories reflect national statistics that show women generally are just as capable of winning elections as men. Waggoner said she is hopeful Oklahoma’s gender gap will shrink significantly when the votes are counted on Nov. 6. But she said the women’s movement is a long-term development and reaching equality in the Legislature won’t occur overnight.